Amazing sound for the price, these are no ordinary "smallish" bookshelf speakers. 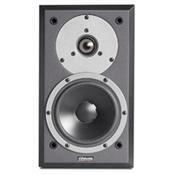 the drivers in these are high quality with a comparable crossover (@ 1800 Hz I might add) work magnificently together. The bass/Mid bass is deep enough for most (50Hz), but doesn't sound bloated or flabby. Nice a taut while not rung to do more than it was designed for. Which equals an excellent sounding lower end. The treble/mids are also very, very good, nice and clear, resolving, and with the crossover @ 1800 Hz, is invisible/indiscernible to the ear. Very easy listening for long listening sessions, which is what I am after. I've been supremely impressed with these tiny dynamos. I first purchased a pair in May, 2012 and was completely smitten with their performance. Very smooth sound that does not become hard and stressed at high volumes. They are quite neutral sounding overall. Some would describe them as warm but I find they simply lack the glassy quality that plagues most speakers when driven to their limits. I was curious about the DM 2/7's and decided to "upgrade" but I found the balance of the 2/6 far superior to the 2/7. The 2/7, in comparison, is far more sensitive to placement and room qualities. In one room they had zero mid-bass punch and extension. In another they were too thick and over-bearing in the low-end. The 2/6's, on the other hand, sound great anywhere - nearfield, small room, big room, anywhere. They just "work". Only downside is your amp has to be up to task. I have these now connected to a Harman Kardon AVR that simply can't do justice to these speakers. I previously was using a Rotel integrated from the 90's and the combo was sublime. I really don't think there is a speaker at this price that can compete. The 2/6's are incredibly impressive! I originally purchased the Dynaudio DM 2/6 for my computer sound system, but have since moved them to the bedroom. I run them off a Sonos ZP120 and I am extremely happy with the sound. They are well balanced, musical, and produce bass that belies their small size. When driven hard the woofer is flapping around, but does not produce the sort of "popping" that I'm used to hearing from speakers being over-driven. My main speakers are Dynaudio Focus 220s which I think are fantastic, and the little DM 2/6 brings some of their sound quality to my bedroom. The great thing about Dynaudio is that their lower line models also offer exceptional performance. I've listened to a lot of other low line models from high end names and they just sound so mediocre. It's clear they took shortcuts in the wrong areas. If you don't want to spend $6000 I highly recommend you try listening to some of the lower end Dynaudio lines. They still use similar / same drivers and materials. The enginering is still excellent. These little DM 2/6s sound a lot bigger than they look. The highs are extremely crisp. However, it took a few weeks to break them in and then finally hear them come alive, as expected.